Home/Blog/LG has won another award! Why choose LG commercial solar panels? After months of consideration and careful planning, you’re ready to take the leap and start saving money (and the environment) with commercial solar panel installation. That just leaves one important question: which solar brand is the best choice for your commercial property or home? We know you only want the very best for your business – especially when huge savings are on the table! With almost two decades in the solar power industry, Pacific Solar has built up partnerships with many solar brands, including LG Solar. In fact, Pacific Solar is proud to be an LG Platinum Partner – one of only 12 in Australia! Did you know that in addition to TVs and refrigerators, LG also makes solar panels? Not only that, but (if you ask us), they’re easily some of the best in the business! LG Solar named top brand PV for 4th consecutive year! You don’t just have to take our word for it either – just last month, LG Solar was awarded the prestigious “Top Brand PV” for the fourth year running by EuPD. Just for reference, EuPD is Germany’s largest solar industry research body. And with Germany getting a whopping 85% of its power from renewables, that’s high praise! LG was lauded for not only “high brand awareness”, but also “high levels of recommendation” from solar panel installers like us! What qualities do LG solar panels have that gave them the edge over the countless other solar brands in the market? When we say “efficiency”, what we mean is how much sunlight your solar panels are able to successfully convert into electricity. Modern solar panels are making leaps and bounds in efficiency… and LG is at the head of the pack! Generally speaking, the most energy efficient panels on the market (as of 2019) hover around 20%. As such, that makes the 21.4% reached by LG’s new Neon R range one of the best in the market – a position we can expect LG to maintain in the years to come! Before buying any equipment or appliances, we often check for the service warranty to ensure that we’re protected in the unlikely event that something goes wrong. Luckily for you, when you opt for LG solar installation with Pacific Solar, you’ll enjoy an industry-leading 25-year warranty – a whopping 15 years longer than the industry standard. Should anything happen to your LG solar panels, a certified LG Solar Partner like Pacific Solar will turn up to honour the 25-year product warranty. We’ll perform repairs and service, guaranteeing two-and-a-half decades of continuous savings. Solar panels are usually installed on roofs, in the open – as such, they’re extremely exposed to the elements. 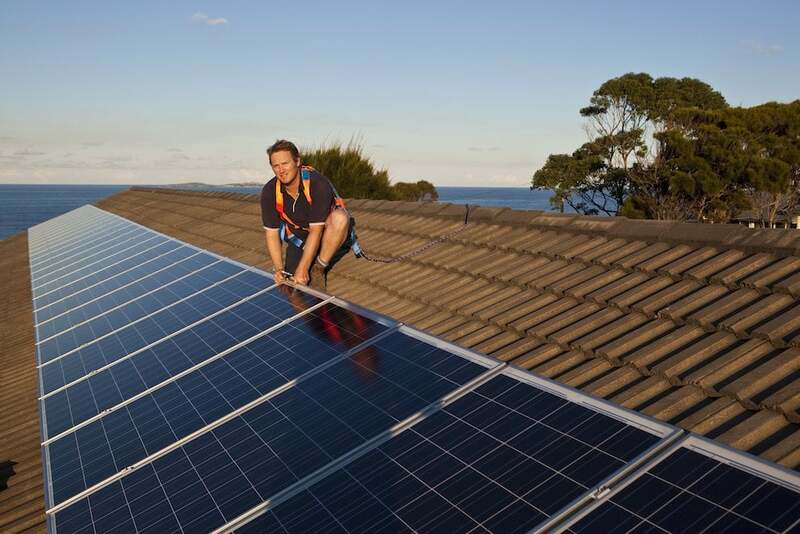 Naturally, it’s crucial that your solar panels are built tough, and are able to resist the huge variations in weather and climate that come with living in Australia. Once again, LG has you covered – LG solar panels are durable and tested to resist hurricane-strength winds. It isn’t just the panels themselves that are tough – LG solar installations are secured using strong aluminium profiles, mountings, and frames that can withstand strong winds and unpredictable weather. The final criteria that LG scored excellently on is technical innovation and development. … revenue that goes directly into funding a large and expansive Research & Development (R&D) effort! So not only is LG a reputable solar manufacturer, but they’re also the driving force behind some of the recent growth of solar panels! Choosing LG solar installation can be one of the best choices you make when considering commercial solar installation. However, that’s just part of the equation. The other part? Finding a good installer to carry it out for you! Not only are Pacific Solar LG Solar Partners… we’re also certified LG Platinum Partners – one of only 12 in the entire country! When you call Pacific Solar for LG solar installation, you can rest easy knowing that our energy specialists work hard to ensure that you’re consistently saving power – and money! Contact Pacific Solar on (03) 9532 3836 or fill in the form to request an obligation-free quote or simply ask us any questions you might have about LG solar installation.